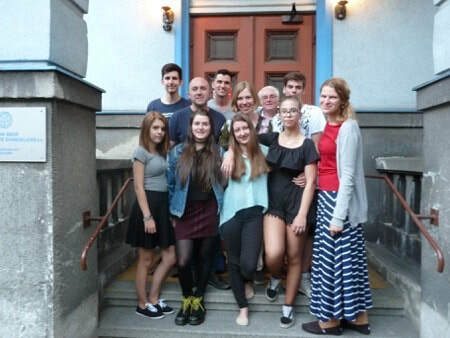 A team of four - including Jana, a 2016 K180 trainee who lives near Bohumín - visited Miriam, Pastor Roman and the church of Bohumín once again in May 2018 (see the Big 3 webpage for details of the 2016 mission). We received a warm welcome from the youth and leaders with whom we spent much of the weekend, training and venturing into the town and parks to initiate gospel conversations. We partnered with the youth in hosting an British Evening for the community who were invited to enjoy tea and scones, hear about the royal wedding, and listen to testimony about Jesus. We were also able to join in on the Bikers’ Blessing which drew around 250 people in from the bikers’ & local communities. We were given the opportunity to preach to all of them about the freedom Jesus paid for on the cross. While many in the community were quick to assert that they did not believe in God, once in conversation, many softened on that stance and ultimately acknowledged the possibility of the claims of Jesus. Join us in praying for the church there and the continued softening of hearts in Bohumín!